The golden arches are about to up their bacon factor. 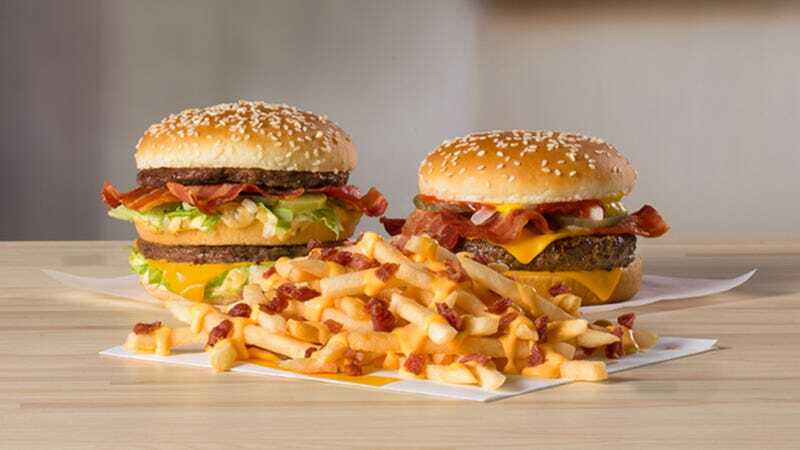 McDonald’s announced yesterday that beginning January 30, it would introduce three new bacon-added options to its menu for a limited time: a Bacon Big Mac, a Quarter Pounder Bacon, and the long-rumored Cheesy Bacon Fries. Both the Bacon Big Mac and the QPB will be topped with three strips of applewood-smoked bacon, while the fries will be covered in cheddar cheese sauce and sprinkled with bacon bits. We are on the record proclaiming Wendy’s Junior Bacon Cheeseburger the greatest fast food burger, and that chain certainly takes the crown in terms of bacon-loaded burger offerings. Why was McDonald’s for so long behind the bacon 8-ball? The menu currently features the Bacon Smokehouse Burger and Double Bacon Smokehouse Burger, plus the Bacon McDouble. But if you just wanted a regular QPC or Big Mac with bacon, friend, you’d have to order that for an extra charge. Adding the bacon option to a standard-sized burger—no additional caramelized onions or beef patties—seems logical given the outright deliciousness of its competitor’s Junior Bacon Cheeseburger. We’re slightly more skeptical of the bacon-and-cheese fries, but it is your right as an American citizen to make your own bacon-related choices (starting January 30 at participating locations while supplies last). Our taster Gwen Ihnat likened the bacon-cheesy side item to getting smacked in the face with a salt brick.